Sharing and pairing locally sourced wine and food crafted with quality ingredients gathered close to home --- with a view, but without the premium prices. 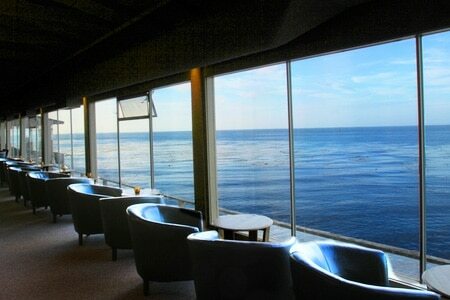 : How to improve on a tasting room with a panoramic view of Monterey Bay and a notable selection of wines from Monterey County? Add interesting bites at reasonable prices, of course. When this tasting room and wine bar decided to add meals to the mix, they called on experienced chef and caterer Dory Ford, known for using quality ingredients gathered close to home. Flavors and textures do the cha-cha on the generous plate of spicy goat nachos with black beans, avocado and spicy-sweet pickled jalapeños. Fresh burrata meets eggplant caponata, and there’s a selection of panini, including the Coastal Carnivore with savory salumi and house-made mozzarella. Portions are great for sharing and pairing. Please note that though early evening dinner bites are offered to the public, the venue transforms into a private event space after dark most nights. Check for hours.